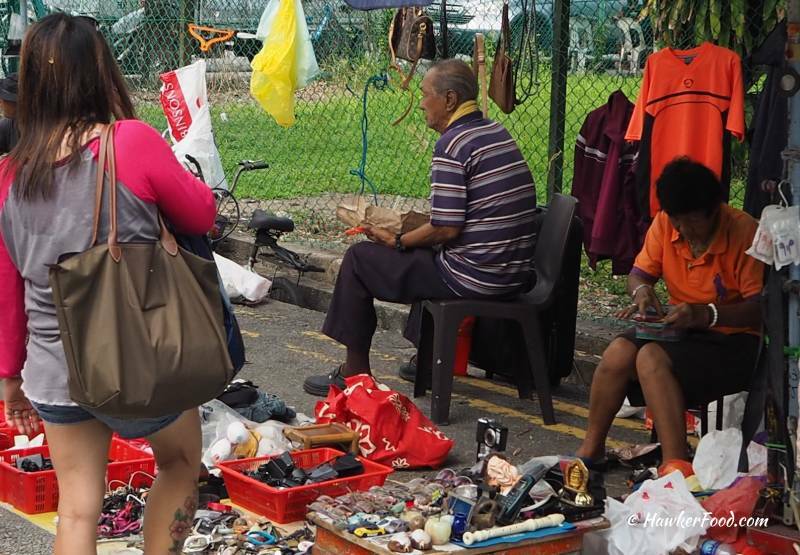 When was the last time you visited Sungei Road Thieves Market? Wait………….did you know that it actually exists (as of writing) and will soon no longer be in existence? 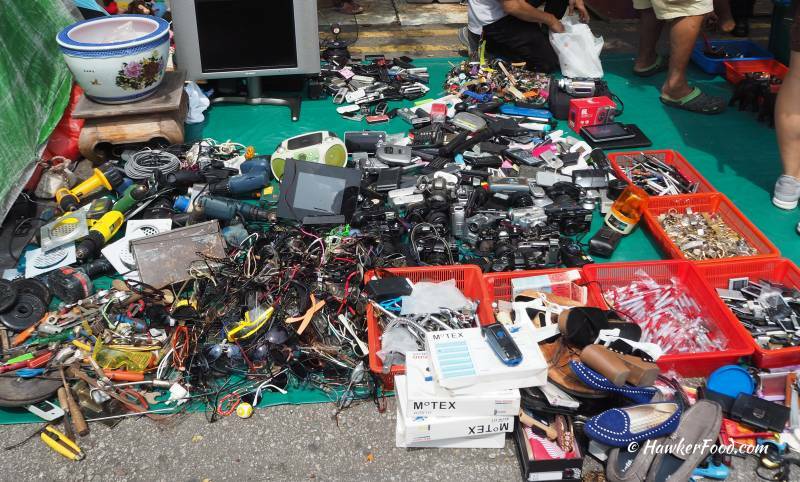 The Thieves Market has been in existence since the 1930s, it is a flea market well-known for second-hand goods like clothes, electronics, antiques, music records, vintage items and various knick-knacks. When I was young, I was always told that if your items had been stolen, you would have a better chance finding them at the Thieves Market than anywhere else. But, that is all in the past. 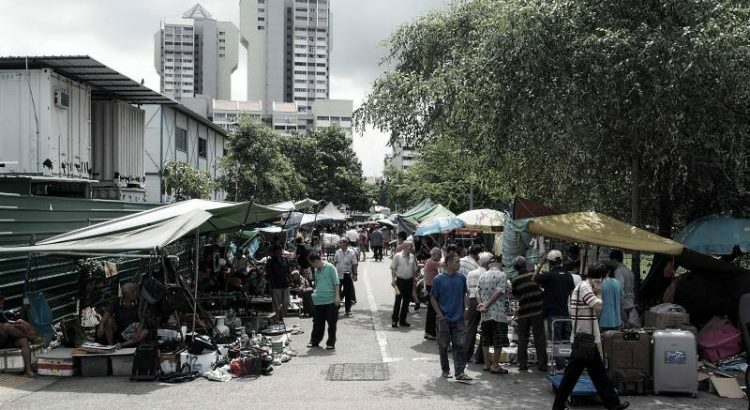 Open every day and especially bustling on a weekend, the peddlers here are mostly made up of the elderly, some are individuals while some are Karung Guni (rag-and-bone man) trying to make a living here. 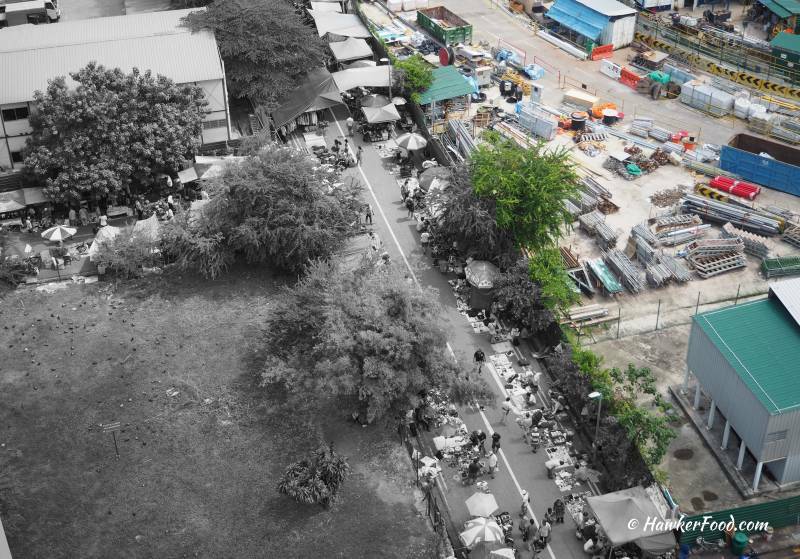 Sadly, they will have to make way for the upcoming Jalan Besar MRT Station which is part of the Downtown Line project. This is likely to happen in 2017. Yours truly decided to revisit this place to capture some of the scenes that will be gone soon. There are many kinds of visitors to the Thieves Market. 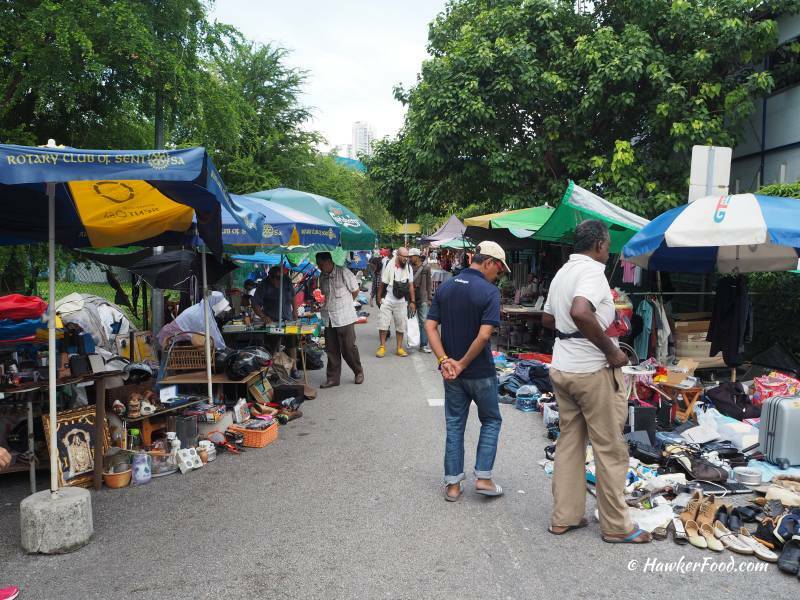 Over here you can see tourists, foreign workers, youngsters…..
…..and especially the elderly, our very own pioneer generation who loves to scour the stalls one after another looking for a treasure or an essential item. 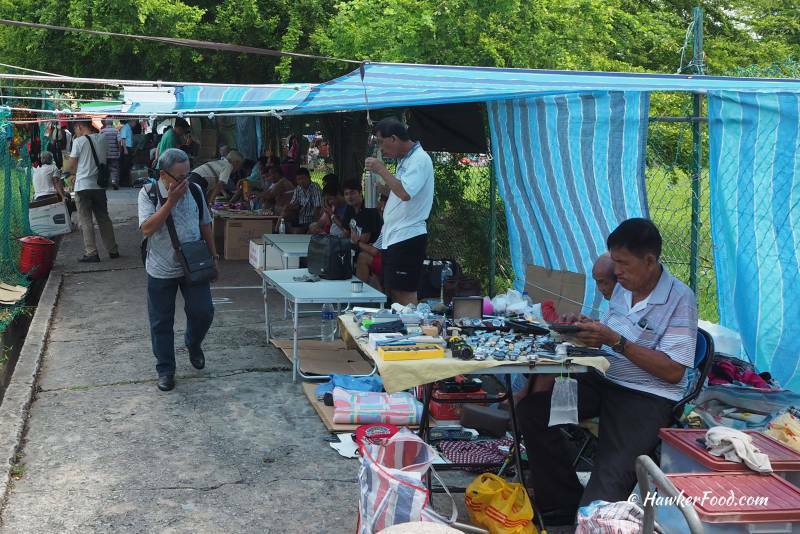 Some of them even armed themselves with a loupe for checking on vintage watches and Thai amulets. 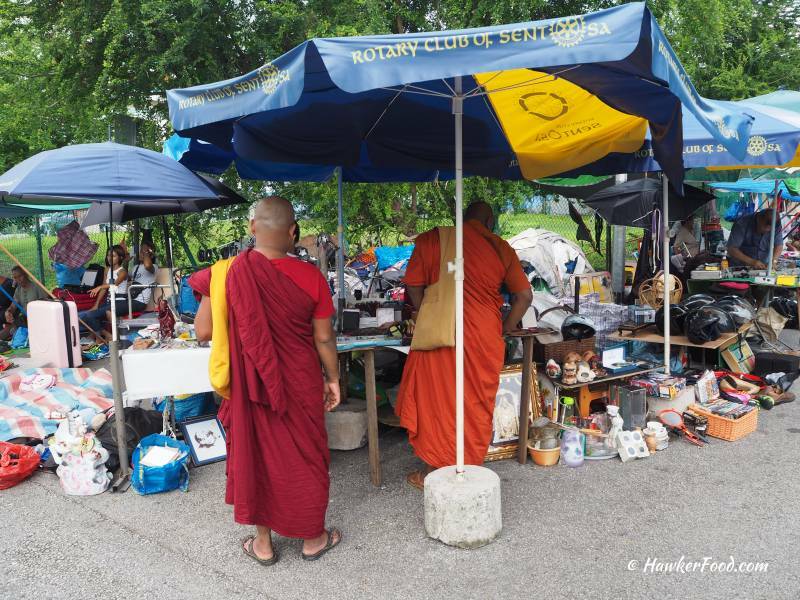 Lao Beng was surprised to even find monks amongst the visitors to the Thieves Market. 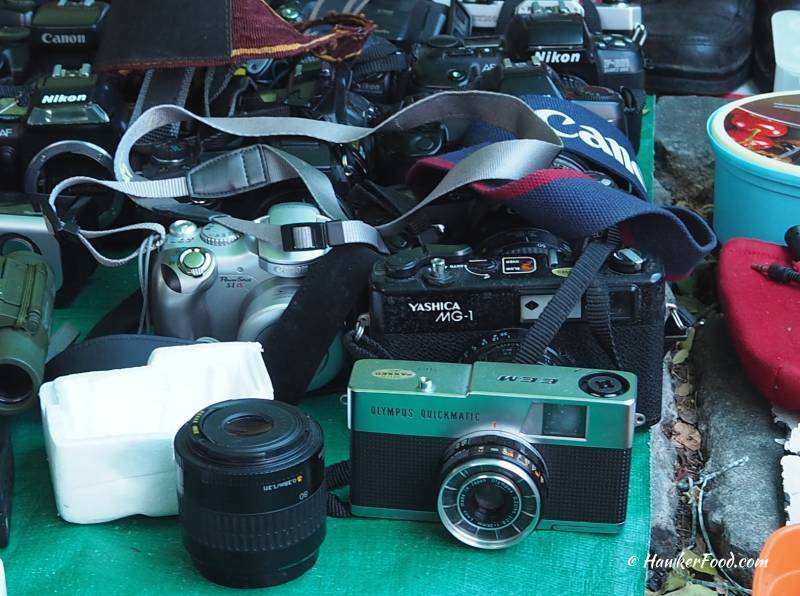 I can still remember during my last visit many years ago, I bought a vintage rangefinder camera for $5 and I wondered if anything will catch my eye this time around. 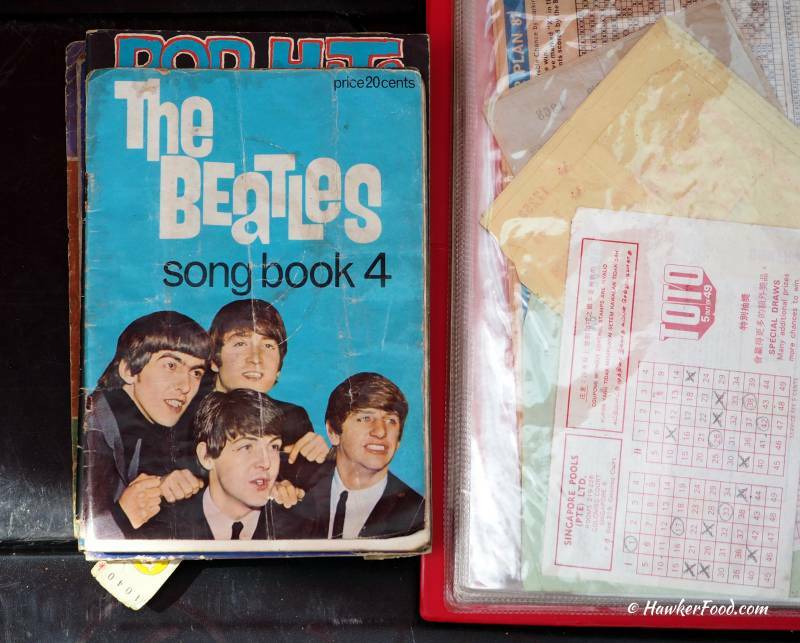 The Beatles look so young! I was equally surprised to find an old TOTO slip on the right. These lovely cassette tapes evoked memories of my younger days of forwarding/rewinding to the next/previous song. I even did a manual rewind using a pen! I still listen to the songs by the singers shown above, especially of Dave Wang (王杰, 2nd row, 2nd from right) . 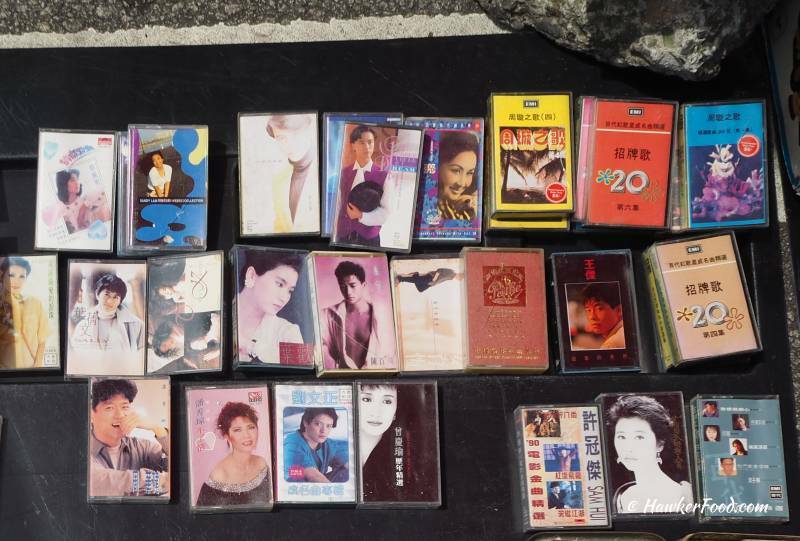 I can never forget the duet he performed with Ye Huan (叶欢) whom is also shown on the cassette (2nd row, 4th from left). The song is “你是我胸口永远的痛” (You are the eternal pain in my chest). 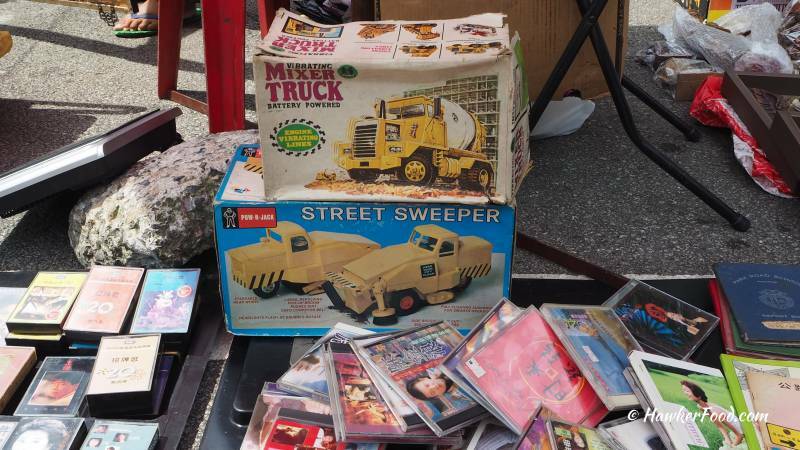 Vintage toys can also be found here amongst the cassette tapes and CDs. 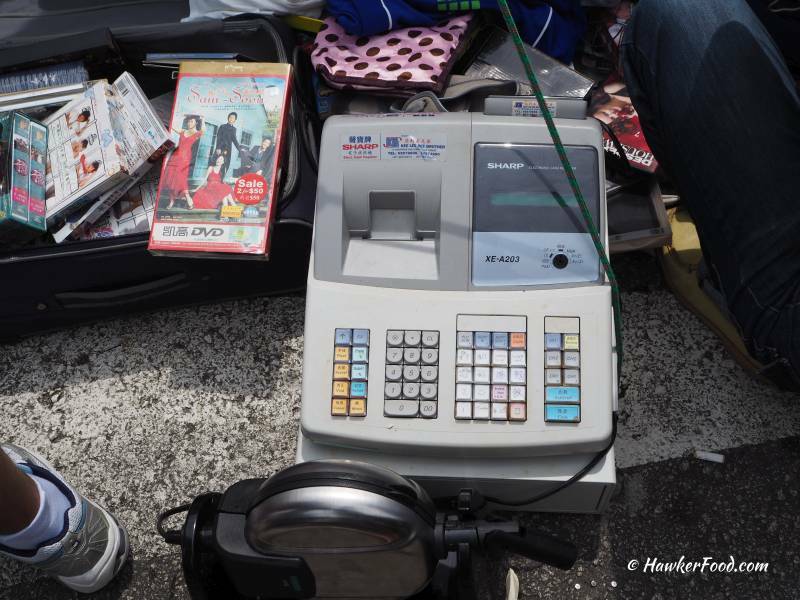 Vintage electronics the likes of film cameras, CD players, transistor radios and many others are available as well. 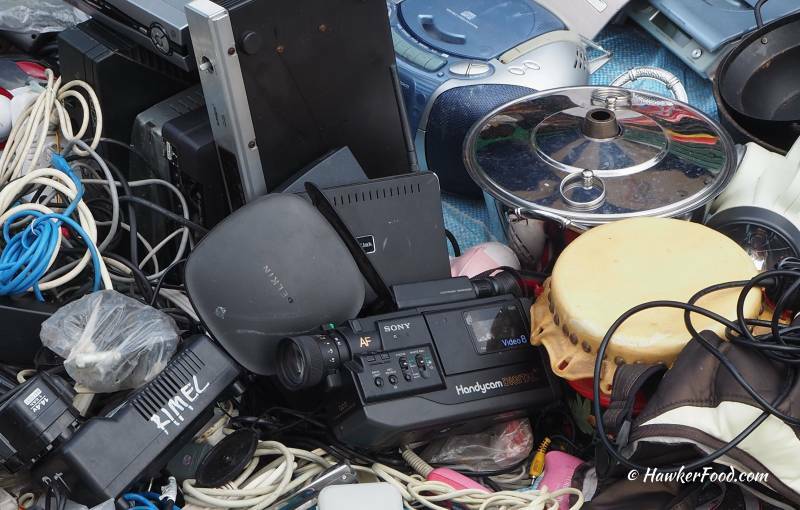 Adding on to the aforementioned items, VCR, routers and even a vintage Sony Handycam can be found here as well. As always, I have a soft spot for the vintage cameras on display. Your shop needs a cash register??? 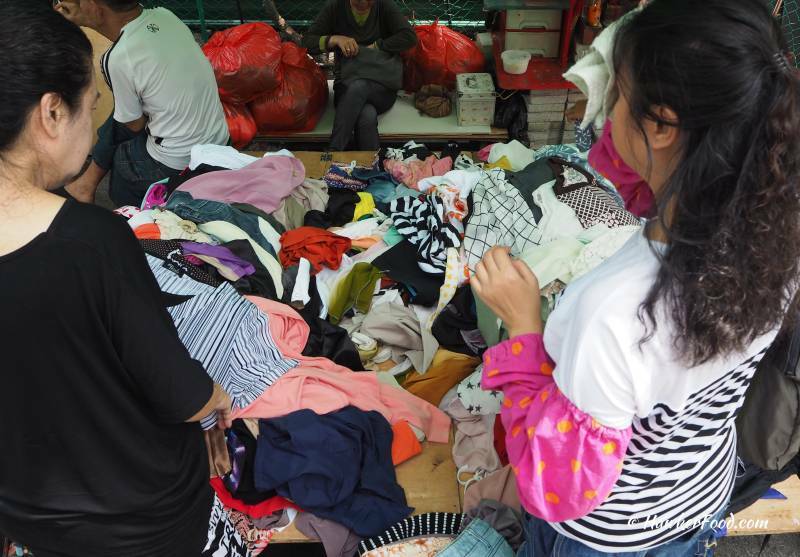 Second-hand clothing stall is a favourite stop for most of the female visitors to the market. 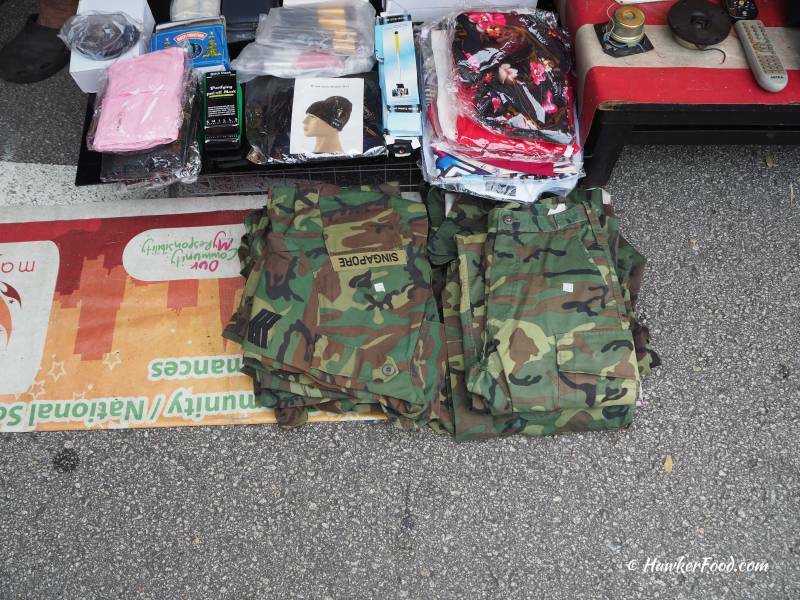 Not the kind of clothing I am looking for, having donned it for 2.5 years (donkey’s years ago). 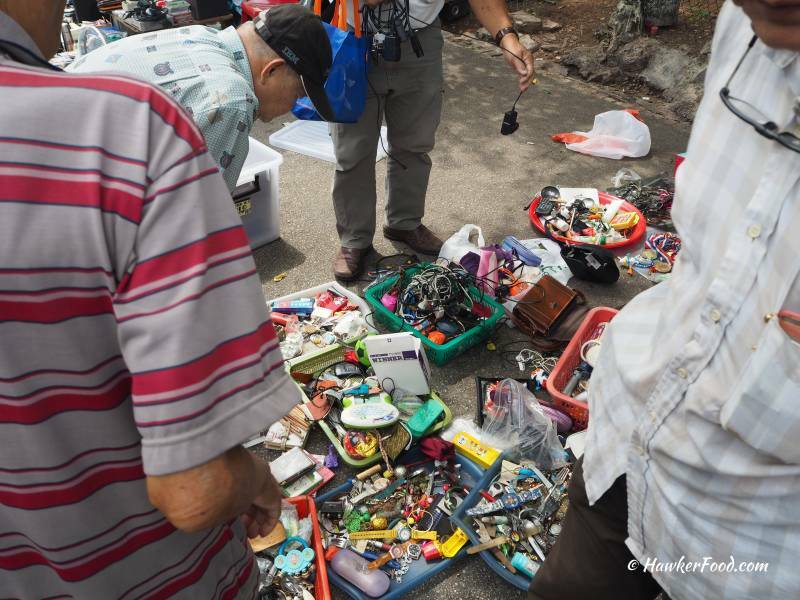 Antique and treasure hunters frequent the Thieves Market as well hoping to unearth a lost art or artifact. 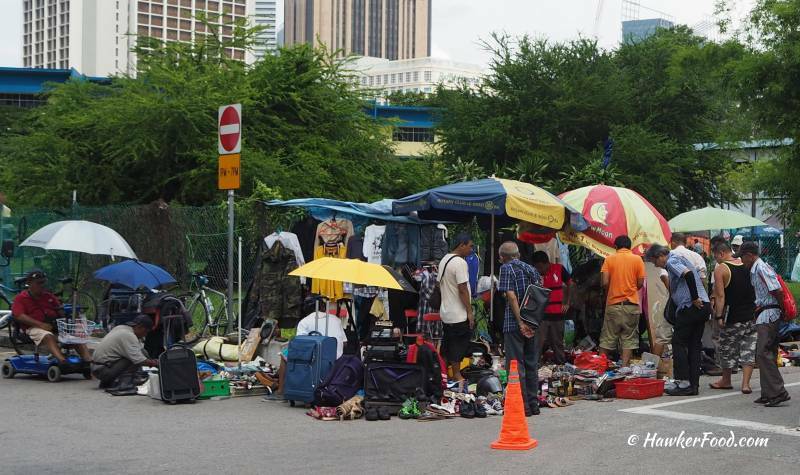 You can clearly see the adventurous individuals eyeing their desired items under the hot sun. 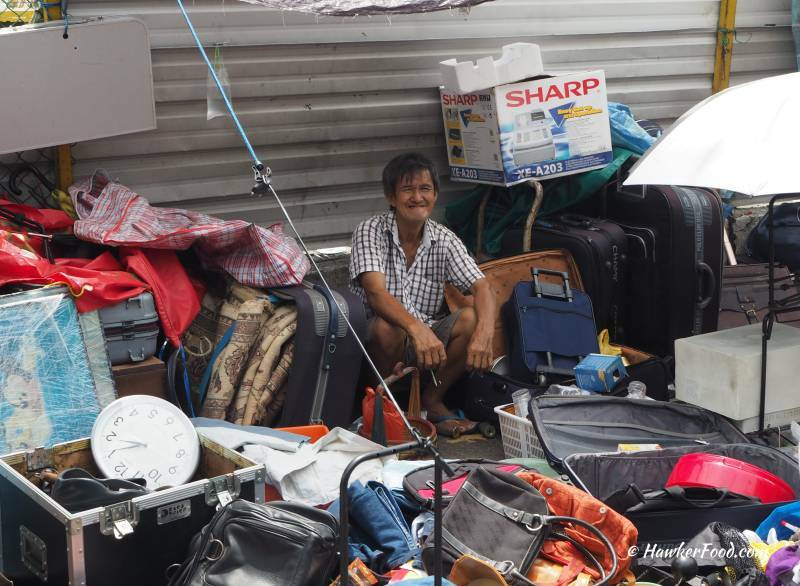 To some, this is their preferred way of spending the weekend instead of shopping in air-conditioned shopping centres or second-hand dealer stores. 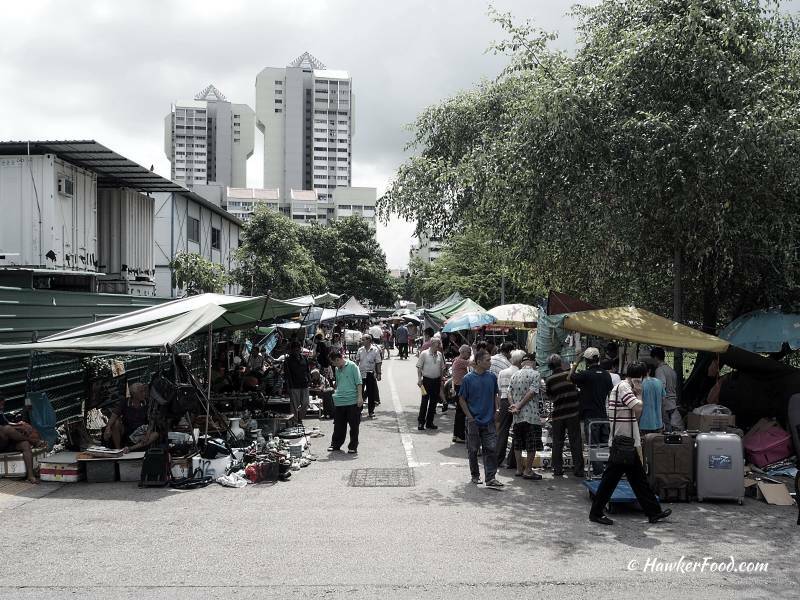 In truth, Sungei Road Thieves Market caters to all walks of life and is a meeting point for old friends. Over the years, relationships have been forged and acquaintances became friends thus it is really a pity to see that it will cease to exist soon. It is understandable that for the purpose of development, sacrifices have to be made. It is easy for me or anybody else to say it is understandable because the sacrifices are not made by us but them. At the end of the day, one can only hope this “band of peddlers” can be relocated together to a place for them to continue their trade…….but one can only hope and wish and some will say it is just wishful thinking. It is sad that we are going to lose this iconic place in Singapore. 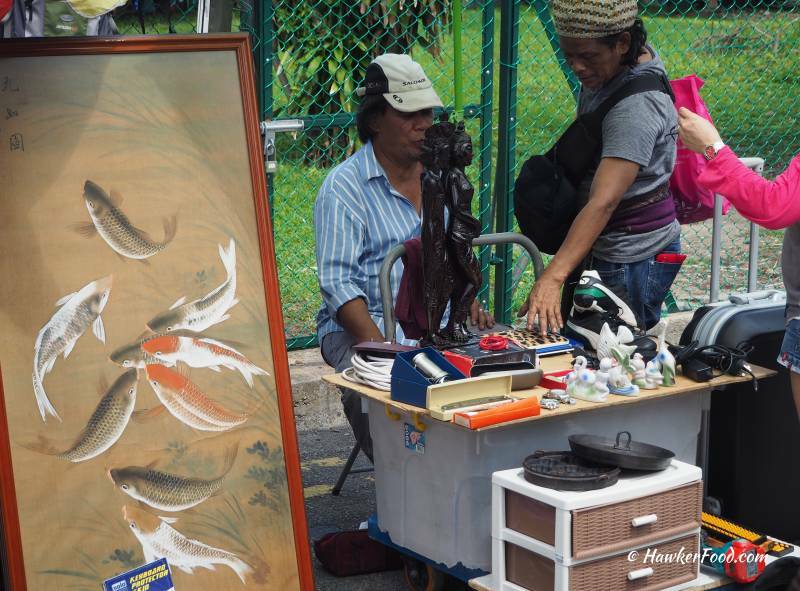 If you have been procrastinating all this while on whether you should visit Sungei Road Thieves Market or not, stop procrastinating and find some time to visit and capture precious memories of Sungei Road Thieves Market.